on November 28, 2017, 1:33 p.m. In the lead up to their nation’s 46th National Day, UAE residents claim they plan to do something extraordinary to mark the occasion. The research conducted by YouGov Omnibus Express in the past four days found that 89% of the population will be celebrating in the UAE, with 34% visiting another Emirate for the long weekend. A third of residents overall will be hitting the shops, of whom the highest proportion will be Emiratis (40%), whilst 30% will attend cultural celebrations. A quarter respectively will be dressing up or joining a rally or parade. Being able to celebrate the birth of their country is very important to the vast majority of UAE residents with 78% agreeing so, whilst 90% claim it is also very important for other nations to do the same. The strongest association with the celebration according to respondents is Patriotism (26%), followed by Unity (25%) and Love (14%). When it comes to planning for the big day, UAE residents reveal their spontaneity with 32% choosing not to plan at all for the event, whist 33% plan less than a month in advance. Taking advantage of the long weekend with a little extra time off work is appealing for 38% of respondents overall, particularly Emiratis (50%), while 42% of the population prefer to work full time in the lead up to and post the occasion; 20% don’t know. 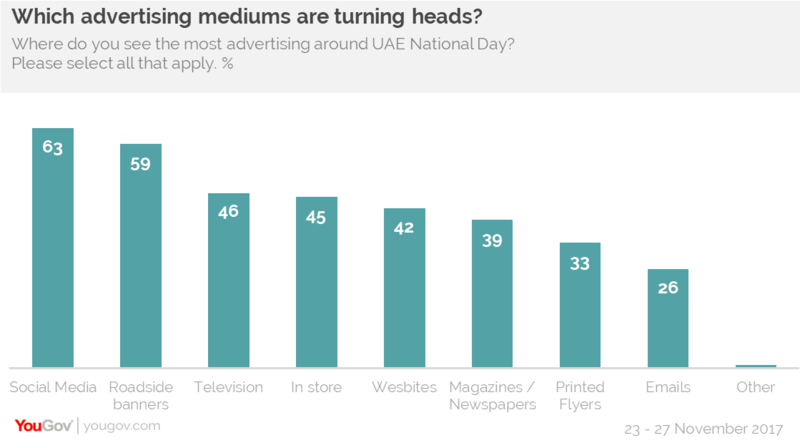 Three-quarters of respondents notice increased advertising around the UAE National Day weekend, and what’s more 68% of the population welcome it, whilst a third always look out for offers. Just 11% claim to be indifferent to the advertising, and 5% are annoyed by it. In particular, 63% of respondents overall claim to notice increased advertising on social media the most, whilst 59% see more adverts on roadside banners. Meanwhile 46% have tuned into increased advertising on television, 45% in store and 42% on websites. Interestingly when looking at advertising observations by nationality, Arab Expats notice the most advertising on roadside banners (64%), while Emiratis notice it more on television (75%). Data collected by YouGov Omnibus Express between 23 and 27 November 2017 among 501 UAE residents. Data is broadly representative of the adult online population in the UAE.